I have been meaning to write about a very significant and exciting experience for the Church in the United States for some time. Unfortunately, recent events in the Church involving the abuse crisis took center stage. While those problems are still very important and in need of attention, let’s talk about something else for a moment, namely the V Encuentro. The Church in the United States had an incredible experience in Dallas, Texas, in late September of 2018. It was the national gathering of the V Encuentro, the culmination of a process that was three years in the making. 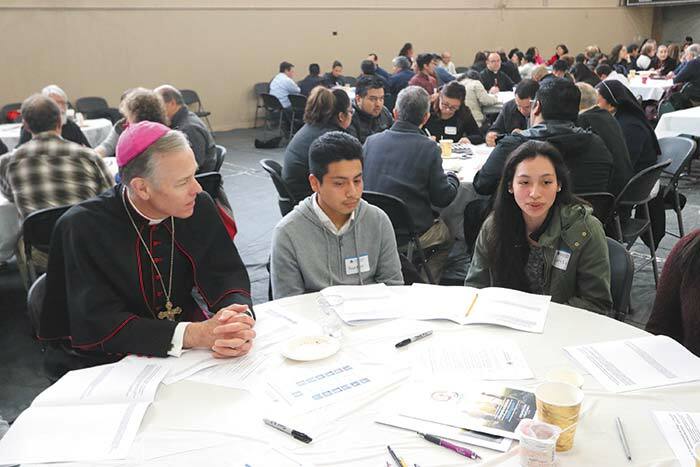 The main goal of the V Encuentro was to discern ways in which the Church in the United States can better respond to the Hispanic/Latino presence, and to strengthen the ways in which Hispanics/Latinos respond to the call to the New Evangelization as missionary disciples serving the entire Church. The process involved gatherings at the parish level, then later at the diocesan level. We held the archdiocesan gathering at St. Joseph Parish in Salem in late January of 2018. This was followed by a regional gathering (Region XII) involving the states of Alaska, Washington, Oregon, Idaho and Montana. We were honored to host that gathering here in Portland in June of last year. I was privileged and excited to be present and participating at both of these events. But, as I said, the culmination of this whole process was the incredible gathering in Dallas, with representative leaders from all across the country. I was able to be part of the delegation from the Archdiocese of Portland that included clergy, religious and lay leaders from western Oregon who are involved with and passionate about Hispanic ministry in our local Church. The national event of the V Encuentro in Dallas was remarkable in that it brought together 124 bishops, 348 organizational representatives along with 2,494 delegates from the 12 regions of the United States. Our Region XII sent 89 delegates. Our archdiocesan delegation found the experience to be very uplifting, encouraging and full of hope for the future of our local Church. While we still await the final report of the V Encuentro process, we do not have to wait to start implementing what were clearly the key findings and recommendations from this wonderful process. The following emerged as the four priorities for Hispanic/Latino ministry: formation, integration, young adults and family life. Formation of leaders from the Hispanic community was seen as a clear priority. But formation for the entire community in various areas of church life and ministry was also seen as a great need. We especially need to identify those from the Hispanic community who are respected and who show leadership potential and provide them with the necessary catechetical and leadership formation in order to have an impact on the vital part of our local Church that is the Hispanic/Latino community. Integration of the Hispanic communities within our parishes with the rest of the Church is essential and the only way forward. We can no longer view the situation as “the Church” ministering TO the Hispanic community. Rather we must see that the Hispanic community IS an integral and essential element of the Church. “The Church” includes our Hispanic brothers and sisters on equal footing with every other member of the Body of Christ. They must be seen and become in reality equal partners in ministry, brothers and sisters ministering side by side with every other cultural and demographic element of the local Church in western Oregon. The outreach to our Hispanic/Latino youths and young adults is critical to our future as a Church, especially here in Oregon. I had the opportunity at both the local and national V Encuentro events to spend time listening to the hopes, dreams and frustrations of young Hispanic adults. They have so many gifts they want to give to the Church, but they often are frustrated in these efforts. We need to listen to them, form them as leaders, and free them to serve the community. If we don’t, we risk losing them for the mission and life of the Church. They face the same risk as all our young people in the cultural climate that is the secular Pacific Northwest. Finally, family life is as important to the Hispanic community as it is for the rest of the Catholic community. The challenges that face all of us are in some way amplified within the Hispanic community because of the cultural and generational challenges they uniquely experience. We must find ways to be especially attentive to these needs, helping to build, strengthen and preserve family life when so many forces seem to threaten this basic human reality. Our Hispanic ministry office and other pastoral center staff, in collaboration with our own delegates to the national V Encuentro and the wider leadership of the Hispanic community in western Oregon, will be working hard to address these clearly identified needs and priorities. Energized by the V Encuentro process, it is my hope that we will build for the future of our local Church so that we may proclaim the Gospel with renewed energy in the power of the Holy Spirit. Please pray for this. May Our Lady intercede for us before the face of her Son, Jesus! WATCH: Four-year 'encuentro' process begins in the U.S. In what language should Religious Ed classes be taught? We are teaching in two languages, but are hearing from parents that the kids do better with English than Spanish. This comment has been hidden due to low approval. As a devout Catholic who lives in San Antonio, which has the third highest Hispanic percentage, I would like to opinionatively suggest that of your priorities, family life should have the most focus. It would be most effective to specifically focus on how to evangelize in the house. This comment has been hidden due to low approval.